Vitamin D is an important vitamin for maintaining the good health of bones and teeth, and is required to help our bodies absorb calcium. Although we can get some from food, such as oily fish, eggs and meat, it difficult to get enough vitamin D from food alone. Often referred to as ‘the sunshine vitamin’, Vitamin D is generally acquired by the body in two ways; exposure to the sun’s ultraviolet (UV) rays and dietary intake, so supplementation is especially important during the colder, darker months of the year when we see very little sunshine. 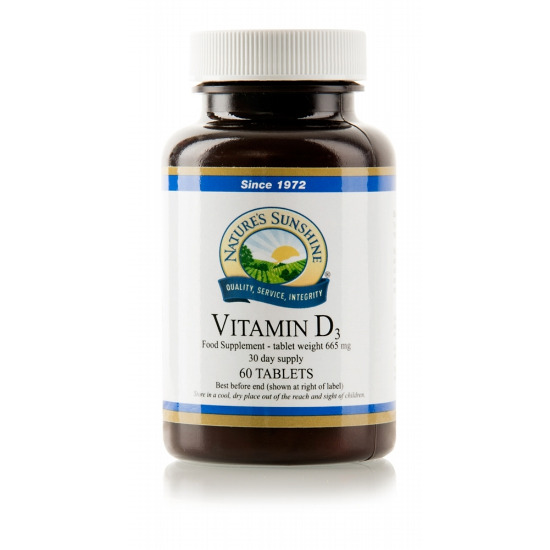 Vitamin D has many roles - it helps in the development and maintenance of bones, muscle, and teeth, and the absorption and use of calcium and phosphorus, it also contributes to the normal function of the immune system and inflammation response. Ingredients: Bulking agents; dicalcium phosphate, microcrystalline cellulose, stearic acid, vitamin D3, anti-caking agents; magnesium stearate, croscarmellose sodium. Recommendation: Take one tablet with a meal one or two times daily. Vitamin D is an important vitamin for maintaining the good health of bones and teeth, and is required to help our bodies absorb calcium. We get most of our vitamin D from sunlight, and although we can get some from food, such as oily fish, eggs and meat, it difficult to get enough vitamin D from food alone. Our bodies make vitamin D when our skin is exposed to summer sunlight so during the winter months it can be particularly difficult to get enough. During the winter, we must obtain vitamin D from our body’s stores and from food sources. Some people in England have low vitamin D levels, and several groups are at greater risk of deficiency. These include pregnant and breastfeeding women, children under 5 years of age, people aged 65 and over, and people who are not exposed to much sun, for example, those who cover their skin, are housebound or who stay indoors for long periods. People who have darker skin, such as people of African, African–Caribbean and South Asian origin, are also at risk of vitamin D deficiency because it takes their skin longer to produce as much vitamin D as it does for someone with lighter skin. Without enough vitamin D children can be at risk of developing rickets, which causes weak and badly formed bones. In adulthood and later life, not getting enough vitamin D can lead to osteomalacia (softening of the bones).